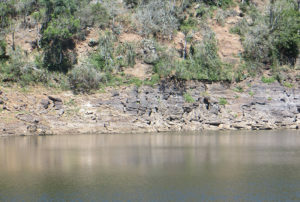 The photographs below, taken from similar angles at different times, show a continued drop in the dam level. 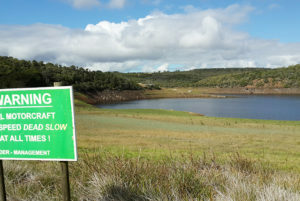 The most recent estimate had the dam, Grahamstown’s main western water supply, at 20%. 18 AUGUST 2017 – after three days of continuous rain. 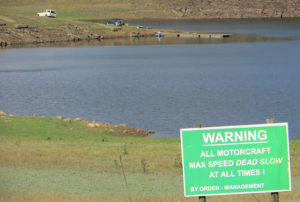 Despite extensive rainfall in many areas of the Eastern Cape over the past week, these have had no significant influence on the Eastern Cape dam levels, the Department of Water and Sanitation said in a statement. The Department appealed to water users to continue to use water wisely and adhere to water restrictions where applicable. 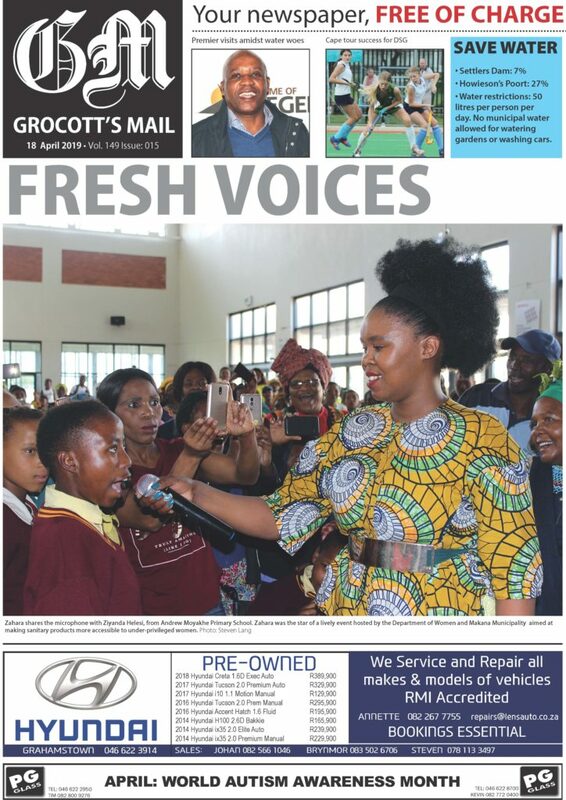 “Despite the recent rainfall in the province, the dam levels are still under pressure and the effects of drought continue in different municipalities. Drought poses a major threat to food and water security,” the Department said. 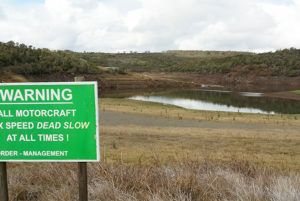 In its weekly report on dam levels, the Department said the total storage of water in the Eastern Cape was at 56.1%. This time last year it was at 66.4%. 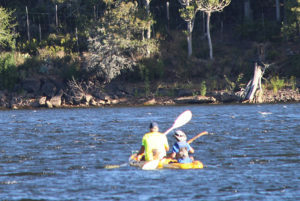 Nahoon reservoir of the Nahoon river is at 55.5%, compared to 89.3% same time last year. Bridle Drift of the Buffalo River is at 40.0%, compared to last year’s 69.8%. Impofu in the Krom River is at 57.1%, compared to last year’s 83.6%. Umtata dam is sitting at 96.5%, compared to 99.0% same time last year. Kouga dam is sitting at 15.8%, last week was at 14.8%, slight increase of 0.1%, whereas last year this time it was at 67.2%. Recent rainfall had also brought no significant change to Amathole District Municipality (ADM) dams and as such water rationing continued, that municipality said in a statement. 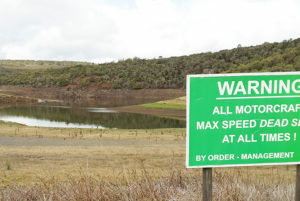 Dutywa dams (Golf Course, Mputi and Ngxakaxha) remain dry. The best estimates we can obtain indicate that, if Settlers can be pumped to 10% and Howieson to 8%, then there is a maximum 107 days of dam water left. This is the best case scenario in the absence of substantial rains. 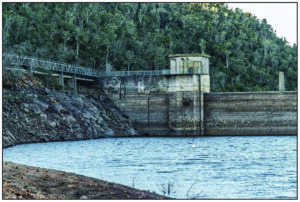 The situation thereafter is reliant on water from the James Kleynhans pumps which can provide about 60% of the total Grahamstown normal demand. There is a further risk that, with continuing drought, other areas reliant on Orange/Fish River water could mean restricted supply to ration the supply between competing needs. 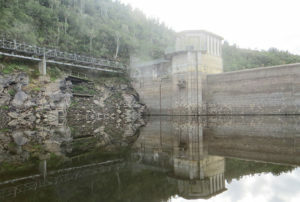 It is anticipated that this is unlikely to reduce the overall supply below 50% of Grahamstown’s total current demand. How long this situation could last with 50% supply is entirely dependent on rainfall. Makana have yet to make clear how the 40-50% shortfall will be managed. Since June, Makana Municipality have advised all of us to use less than 100 litres of water per person and to limit use to normal indoor washing, cleaning and cooking, drinking. Strictly No hosepipes to be used for Municipal water, and other outdoor activities to be greatly reduced, no filling of pools, water plants sparingly, hand wash cars if you must. Right now the water supply is functioning normally, but this could change at any point. It was originally anticipated that Howieson could not be pumped normally below 60%, and now we are at 45% and the pumps are still working. At some point the risk of cavitation and damage to the pumps becomes too acute and they will have to be switched off. When this happens the Settlers pumps will continue pumping so that Howieson refills to a level where it is safe to start pumping up to the lay dams again. To reach lower levels and make use of all the dam water that could possibly be pumped remedial work needs completing. The bottom outlets must be cleared of obstructions and adapted so that the risk of cavitation is prevented. The exact details, as explained in the Final Blackwater Dive report were supposed to have been shared two weeks ago. Sadly, Director Dali Mlenzana, who is the acting Municipal Manager has been taken very ill. As a result there’s been no-one at Makana available to inform the public about progress on measures to address the current water crisis. We will continue to enquire and update you as soon as we can. 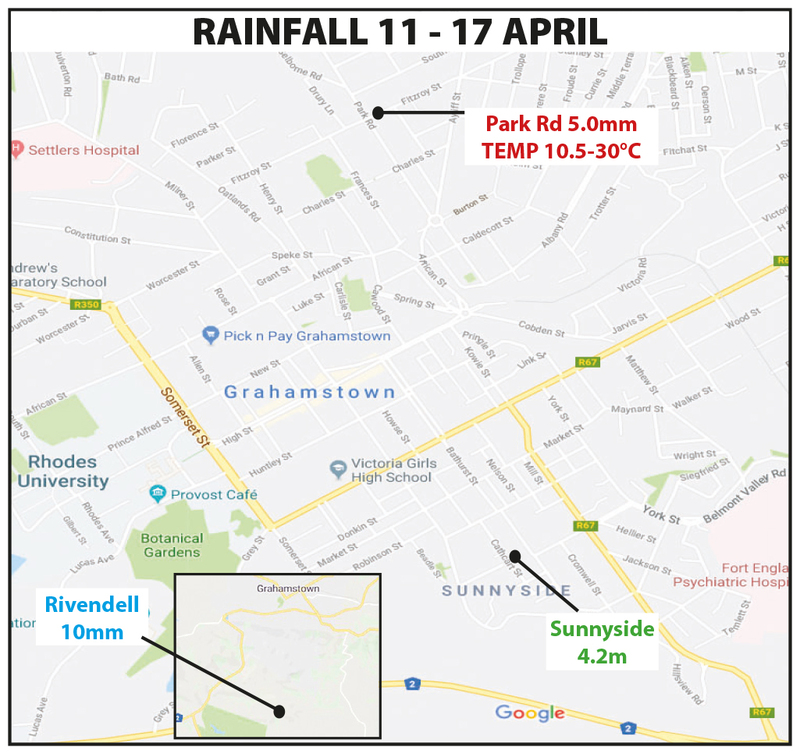 Also, once we become reliant on transferred water from James Kleynhans pumps, that water cannot reach high lying areas in west Grahamstown at present (eg Army Base, Correctional Services, parts of Hill 60). It is planned to install a booster pump to overcome this problem. GRA is making daily contact with Makana to check on progress in obtaining funding and implementing necessary measures. Weaknesses, such as Makana’s communications are all too apparent. Makana have already stated that they do not have the capacity to enforce restrictions, so it’s all the more important that civic society works together and please raise issues of water wastage that you spot either directly, or give GRA a call. Every little helps. Please note: there is currently no restriction on using borehole water. Where it is being used for irrigation there should be signs prominently displayed indicating that it is borehole water. If you have any questions we will try to obtain answers which we will share to everybody.